This mason jar banana pudding is made from scratch with real, recognizable ingredients for a sweet treat you can feel good about enjoying. I’m happy to partner with Bob’s Red Mill for this recipe post! 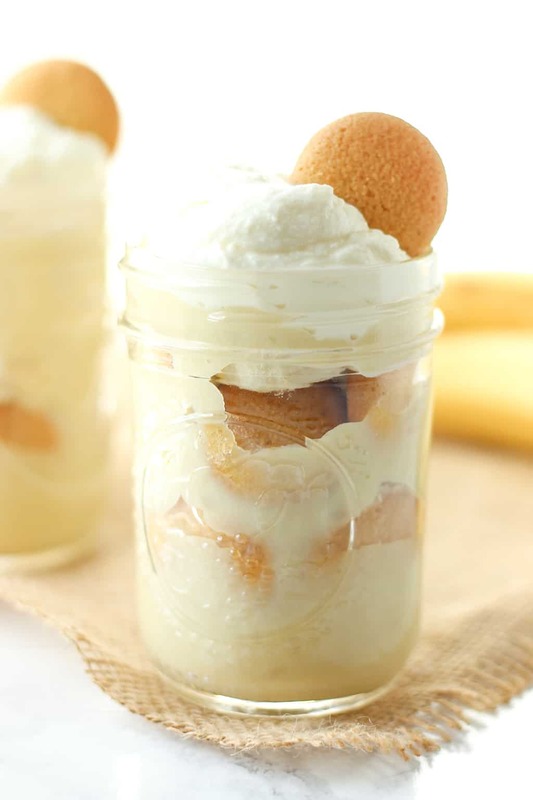 Banana pudding + mason jars are two classic Southern things, so it makes sense to combine them, right? I was excited when I had this burst of inspiration and I couldn’t wait to make them. Banana pudding is one of those things that looks so pretty layered in a big trifle dish and then looks really messy once you actually try to serve it. The mini individual servings fix that problem and they’re cute, too. And then I googled “mason jar banana pudding” or probably actually something like, “jar mason pudding banana,” and someone had already done it. Multiple somebodies. I should’ve known. BUT the recipe itself is completely unique. Homemade banana pudding is something I grew up making in my house, starting with a basic recipe clipped out of a Southern Living magazine and making small adjustments to it over time. The ingredients in pudding mix aren’t the most natural, so I think homemade pudding is the way to go when possible. Years later, I’ve ended up with a recipe that a) I think tastes better because it’s not cloyingly sweet and b) is actually a bit healthier in some ways. 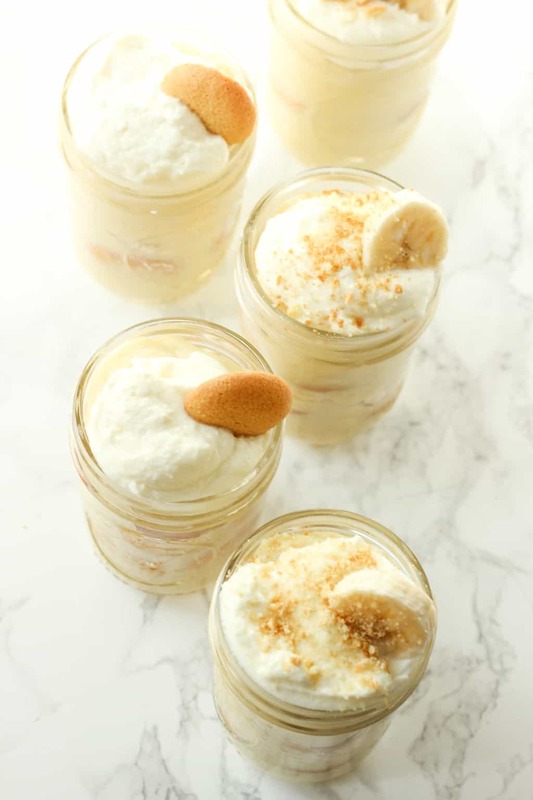 This mason jar banana pudding isn’t health food, but with all natural ingredients, reduced sugar, and controlled portion sizes, you can feel good about enjoying it for a sweet treat. And it’s perfect for spring/Easter baking because it just looks like spring. • Halved the sugar. The vanilla wafers, bananas and (optional but non-optional) whipped cream is sweet, so the pudding part doesn’t need to be extremely sweet. I honestly think it tastes better this way. 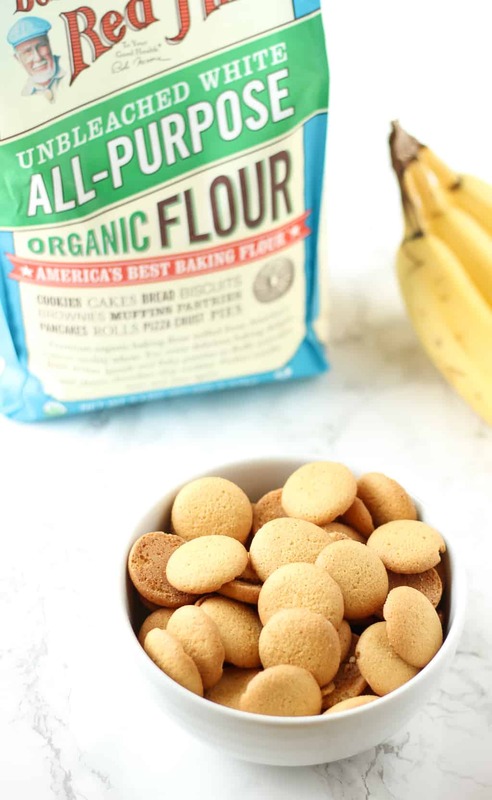 • Used high-quality ingredients like organic whipping cream, all-natural vanilla wafers, & organic unbleached all-purpose flour, like Bob’s Red Mill brand. Unbleached flour is key and I love that this flour isn’t enriched with any additives. It’s freshly milled from organic hard red wheat and then just the bran and the germ are removed to turn it into the white flour perfect for baking that we know and love. I found all-natural vanilla wafers with a fairly short, pronounceable ingredient list and bought the mini ones so they’d fit better in the small mason jars. I used half-pint jars, which are the perfect size for individual servings. I bought a pack of 12 for less than $10. 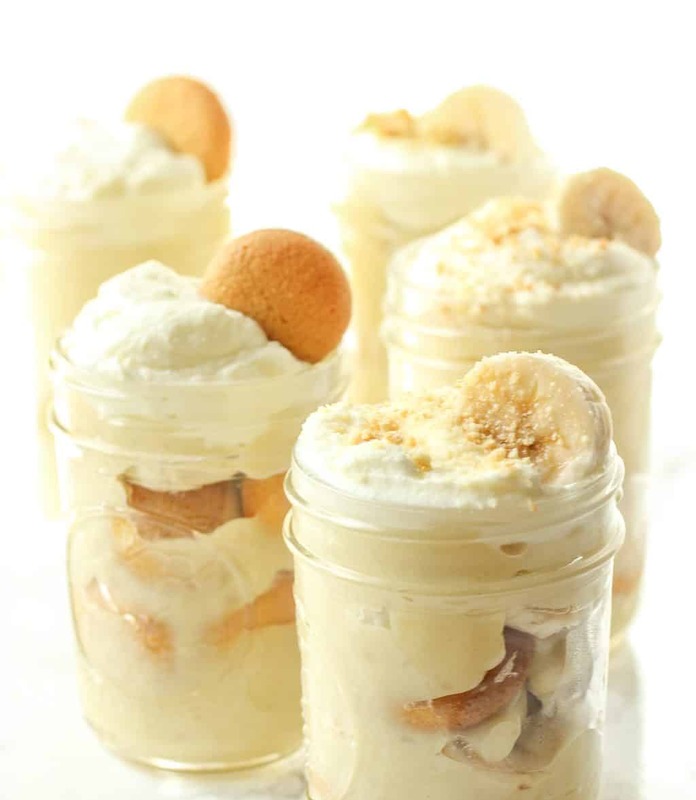 If you don’t have mason jars, you can absolutely make this banana pudding in an 8×8 or 9×9 dish and layer it the same way. Like most of the recipes on the blog, I made these in my college dorm kitchen. I had to get creative when it was time to whip the cream and I had no mixer, so I poured the cream into one of the mason jars and shook, shook, shook probably for a good 10+ minutes. Around minute five, I started missing my stand mixer at home, but shaking it up worked surprisingly well (and seriously worked my arms)! I made six of these last weekend and delivered them to friends as little gifts after I sampled one for quality control 😉 I got several requests for the recipe, so I think they were a hit. Here it is! If you try out this mason jar banana pudding, feel free to let me know in a comment or take a picture and tag me @livbane on Instagram. Hope you enjoy! To a liquid measuring cup, add 2 tablespoons of flour and a splash of almond milk. Whisk until smooth, add more almond milk to fill to the one cup mark, and pour into a medium saucepan. Repeat three more times, until 8 tablespoons of flour and 4 cups of milk are in the saucepan. Cook over medium-low heat, whisking continuously for 2-3 minutes. Enough whisking should prevent any lumps from forming, but if you do get lumps, you can strain the flour and milk mixture at this point. Once the flour and milk mixture is smooth and beginning to thicken, whisk in sugar and salt. Lightly beat the egg yolks in a small measuring cup and whisk in a small spoonful of the hot milk mixture to "temper" the eggs so they don't scramble once you add them to the hot pudding. Add eggs to the saucepan and whisk constantly for at least a minute. Cook over medium-low heat for 10 to 15 minutes, until pudding can coat the back of a spoon. Remove from heat and stir in vanilla extract. Let pudding cool for 20-30 minutes. 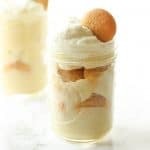 In six half-pint mason jars, layer pudding, vanilla wafers, banana slices, pudding, vanilla wafers, banana slices, pudding, and then add an optional layer of freshly whipped cream on top. Refrigerate for at least three hours, and then enjoy within 24 hours for best taste. Thanks, Bob’s Red Mill, for sponsoring this post & thanks to my readers who enjoy these posts that help keep Healthy Liv up and running! What Boxes Do You Put Yourself In? This looks absolutely delicious! I’m such a sucker for banana anything – banana cream pie, banana pudding, you name it! So am I! Chocolate usually has my heart but banana pudding and banana cream pie are hard to beat. Have you ever had Cheesecake Factory’s banana cream cheesecake? So good! I love homemade pudding; there’s a thickness and creaminess about it that I haven’t gotten in pudding mix. We made the same thing for my mama’s birthday last year; it was SO GOOD! I would love to try it in a mason jar though. Pudding mix has a little bit of a different aftertaste to me, too. Love homemade pudding! I tried this and think it is the best banana pudding I have had in a long time…and so pretty too! Thanks, Liv, for a new go-to recipe! Same! Vanilla wafers and bananas are great on their own and when they’re combined with pudding, they’re unbelievably good! Aww, love that it reminds you of your grandma! I’ve never tried making homemade pudding before–I’ve always been a bit intimidated! But this looks so tasty and not too difficult, either! Vanilla wafers were my absolute favorite snack as a little kid. 🙂 And how cute are the little mason jars for serving?! It’s not too difficult at all, promise! I probably won’t be making it again in the dorm kitchen anytime soon but it’s very doable! This looks amaaaazing! And these jars would be perfect for entertaining because they look so good! Ah this look so yummy! Love banana budding but havent had it in forever 🙂 Such a great idea!! I love these! Is there an expiration date for the banana pudding jars! I plan in giving them as gifts. Love that idea! I’d try to deliver them within 24 hours of making them. They’re delicious for about 48 hours, so I’d just let your lucky gift recipients know that there’s a “best if eaten by” time frame!